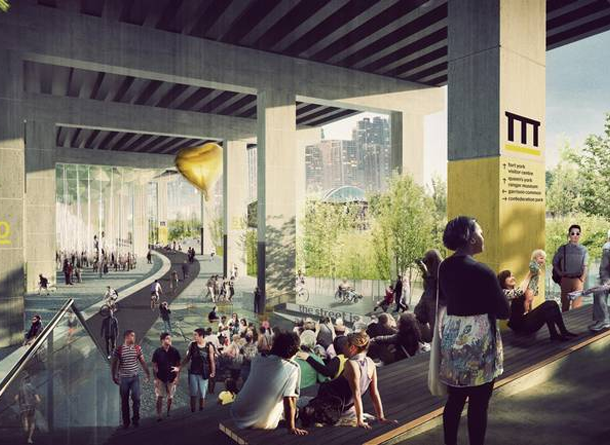 You may have read the news this morning that Toronto has received an unprecedented gift of $25 million to be used towards Project: Under Gardiner, an initiative that would “combine a walking and cycling trail with covered public spaces that can be used for markets, meetings and performances,” according to the Globe and Mail. At first glance, the whole thing sounds great – a private donation, a short timeline to get this up and running, taking advantage of unused space. However, the park would still be underneath a busy six lane highway and beside another busy six lanes of traffic. And while it’s true that the city is undertaking major renovations to that section of the Gardiner (potentially concurrently with construction of the park), even without taking the risk of having a chunk of concrete fall on you, the space underneath the Gardiner is bleak – often dark even during the day, not to mention the noise from the traffic above. Don’t get me wrong though; I am hopeful that this becomes a vibrant new space because I actually love the idea of taking over any dreary, vacant, unused public realm and bringing it to life!